Can a pattern have good bones? I think so. 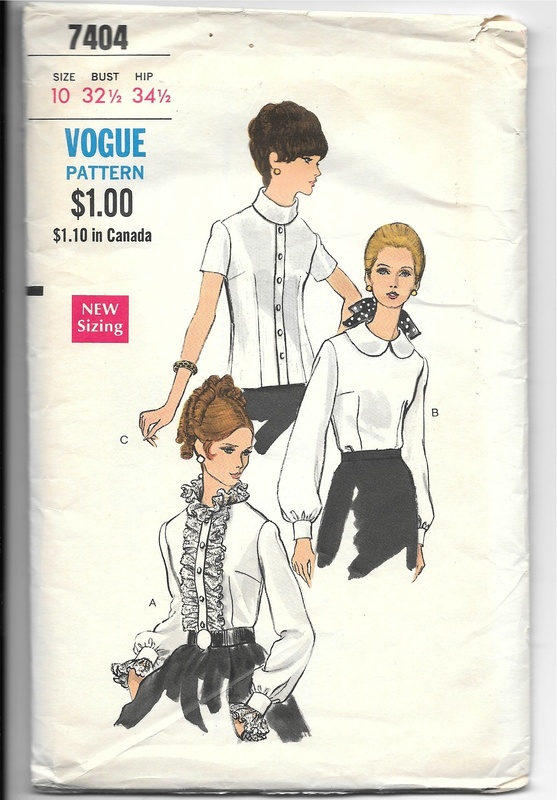 When I purchased this blouse pattern a while ago, I did so knowing that I would not be making a blouse that looked exactly like any of the three illustrated on the pattern envelope. I have always liked a feminine-looking blouse that opens in the back, and I have always liked Peter Pan collars (which seem to come in and out of fashion). I also like a blouse that is fitted with darts through the body of the blouse. You can easily see the darts illustrated above. 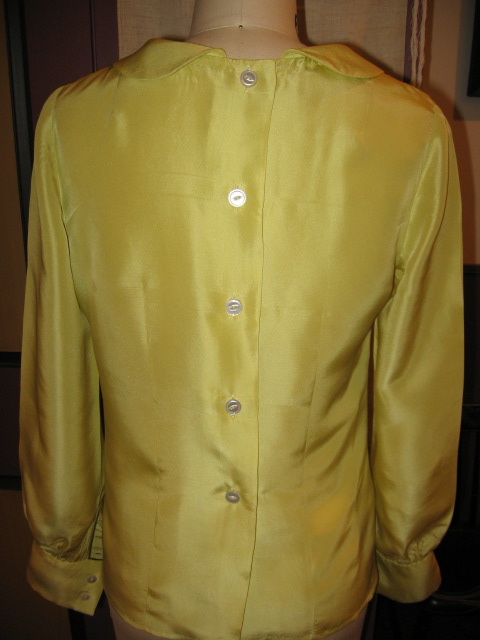 The thumbnail views of the blouses also show the darted fitting in the backs of the blouses. I found it interesting that these blouses are constructed with zippers in the backs. I am not fond of blouses that are zippered up the back, but I knew that I could easily make the back into a buttoned closure. 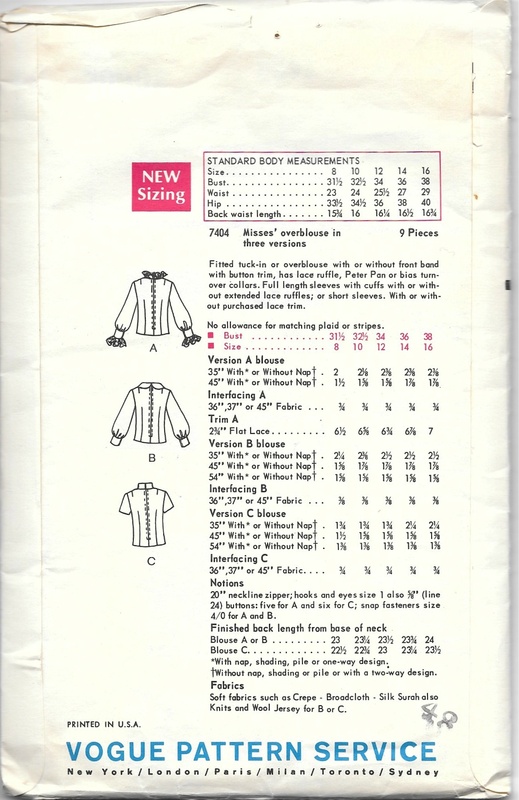 Interestingly, this pattern is from a narrow period of time when Vogue initiated their “new” sizing, which added a half-inch to sizes 8 and 10 in the bust and in the hip. I believe this new sizing was only in effect from about 1968 through about 1972 or ’73. In any event, it helps to date this particular pattern. 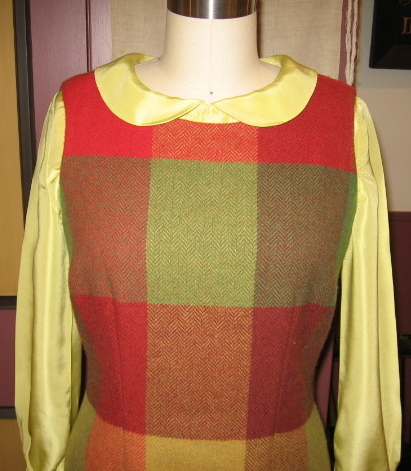 When I decided to make my blanket dress into a jumper, with a blouse matching the yellow lining, I went to this pattern for its good bones: darted fit, back opening, and pretty sleeves. I re-cut the neckline so that it was wider, following the neckline on my completed jumper. The Peter Pan collar was too wide to my thinking, so I narrowed it by about an inch. Instead of using facings, I bound the raw neck edge with self bias binding. 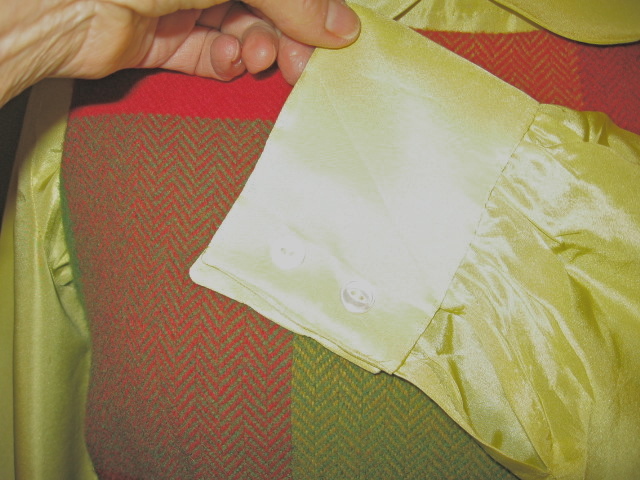 The hand-stitching on that is hidden beneath the collar. You can see the wider cut of the neckline of the blouse in this photo. 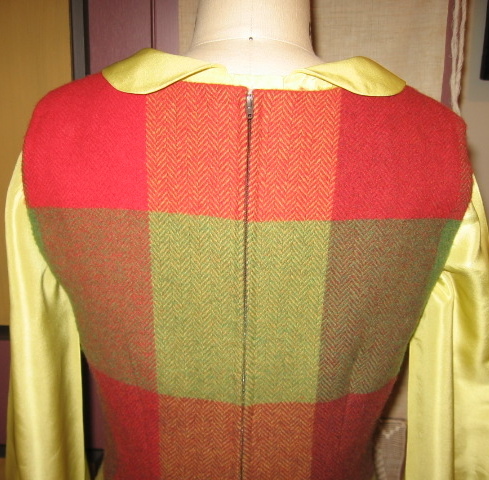 The slightly fitted bodice helps it to lay without bulkiness underneath the jumper. I found vintage mother-of-pearl buttons in my button box, two smaller ones for each sleeve and five slightly larger ones for the back. Why it always give me satisfaction to use buttons I have on hand, I don’t know, but I was feeling quite delighted with my finds! Less than a month ago, when I was “planning” out 2015’s sewing, I did not envision that January would also produce a blouse to wear with my blanket dress. 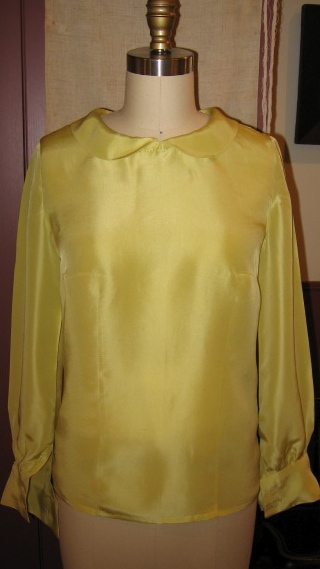 But that is one of the charms of fashion sewing – the spontaneity of a project that says “Me, Me, choose Me!” And so I did, and I am not only happy with the result, but delighted to have a tried and true “good bones” blouse pattern to use again and again, whether in the plan or not. I love a Peter Pan collar — and this blouse is perfect with your fringed jumper! The color is spot on, too. Thanks, Cissie! It’s amazing what one can find in a fabric closet! Beautifully made. I agree, sometimes finding just the right number of buttons in your “tin” is so satisfying, and even more so if there are the right number of smaller ones also for the sleeves. Isn’t sewing wonderful. Enjoy! Oh, yes, Kim, sewing is very wonderful. And it is so much fun to share excitement over little things like buttons with people who understand what it is all about! Thanks so much! 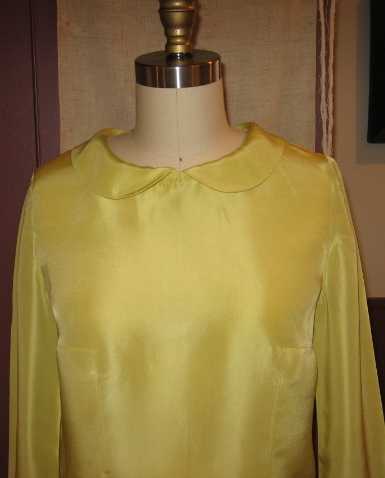 I love the changes you made to the neckline and collar. It took all the primness out and it is just perfect with your jumper. Thanks, Lizzie. I am quite happy with how the blouse turned out! I’m a big fan of shaping with darts, too. It makes such a difference in fit! The blouse looks great. Enjoy that outfit! You certainly know how to find the best patterns! I love the flower silk/ fringed wool combination in your outfit! So maybe “flowy” is a word!!?? There is nothing quite like a vintage pattern to get my mind focused! It sounds like a word to me, but never trust a non-native speaker! This is really lovely. Good bones indeed. I love using buttons with history too! It’s the little things that add so much to a sewing project – like buttons with history! I think, long ago, I made a blouse with a zipper in the back. It had a Peter Pan collar too. Your’s looks lovely and matches your dress perfectly. A designer original! Darts are awesome. And I agree about good bones – once you find the right pattern for your body you can mix it up a whole lot and know it’s going to come out well. I like the parameters that planning gives me, but I always like to stay flexible, too! I agree – darts are awesome!